The benefits of improved memory are endless. Join nationally recognized memory training consultant, Paul Mellor, for a session that will improve the way your mind retains facts. Learn techniques to improve your memory and learn how to apply these techniques to your everyday practice. Mellor’s objective is to show you how a trained memory can increase your efficiency and productivity in all aspects of law. He will shred the myth that memory cannot be enhanced and will help you lay a foundation for total recall. forget and how we remember. Discover secrets on how to present a case without notes. in remembering to ask key question during cross examination. when dealing with those on the witness stand. names and groups of people. BONUS! BONUS! BONUS! Your registration includes Mr. Mellor’s 305-page book, MEMORY! 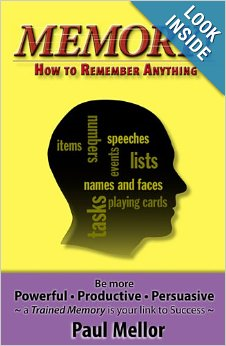 How to Remember Anything. "soft" skills of law versus all black letter. Very helpful and clever suggestions. Extremely interesting, superbly presented - and useful! Could not be better or more interesting. Excellent! So applicable to our practicing law! Unique - useful training that is applicable professionally and personally. He was a fantastic speaker - one of the best I have hear at any CLE. Challenging! Practical application, superb delivery! A genius in his field! Very entertaining. Appreciated the applicability to both law & everyday life. Outstanding. Excellent presentation & subject matter highly relevant.